Apache ActiveMQ has extensive support for JMX to allow you to monitor and control the behavior of the broker via the JMX MBeans. Run a broker setting the broker property useJmx to true (enabled by default) i.e. The ActiveMQ broker should appear in the list of local connections, if you are running JConsole on the same host as ActiveMQ. Remote connections to JMX are not enabled by default in the activemq.xml for security reasons. Please refer to Java Management guide to configure the broker for remote management. For additional references provided below is a brief hierarchy of the mbeans and a listing of the properties, attributes, and operations of each mbeans. Command line utilities are also available to let you monitor ActiveMQ. Refer to ActiveMQ Command Line Tools Reference for usage information. 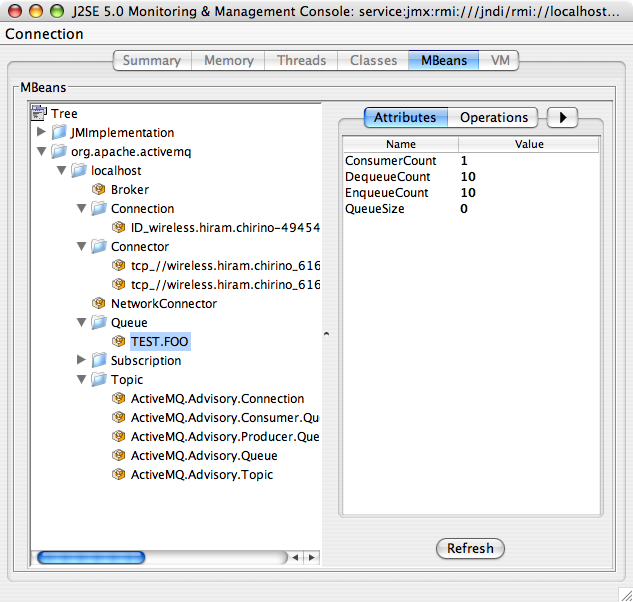 Make sure JMX is enabled, but tell ActiveMQ not create its own connector so that it will use the default JVM JMX connector. # The "monitorRole" role has readonly access. # The "controlRole" role has readwrite access. # The "monitorRole" role has password "abc123". # The "controlRole" role has password "abcd1234". And you will be forced to login. In situations where you need to scale your broker to large number of connections, destinations and consumers it can become very expensive to keep JMX MBeans for all those objects. Instead of turning off JMX completely, starting with 5.12.0, you can selectively suppress registration of some types of MBeans and thus help your broker scale, while still having a basic view of the broker state. createMBeanServer true If we should create the MBeanServer is none is found.